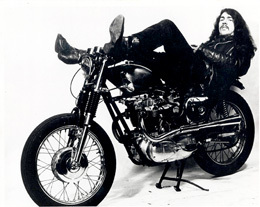 In the 1960’s, Joey Skaggs loved motorcycles. He rode them and he raced them. Skaggs lived on 2nd Street between 2nd Avenue and the Bowery in New York City. Many of his neighbors were members of motorcycle gangs. They didn’t have long hair. Very few people did. Joey said his reason for having long hair was that he was trying to get as much out of his head as possible. In actuality, he probably did it to be cool and to piss off his father. To satirize the Hell’s Angels and weddings (Skaggs believed that marriage was the legalized enslavement of men and women) and to generally have a good time and blow some minds, Skaggs built a customized tricycle (the precursor of his Portofess in 1992) and decorated it with all sorts of Rican (as in Puerto Rican) car stuff — fox tales, horns, lights, flags, a radio, lots of chrome, etc.. It was a poor man’s ’57 Chevy. 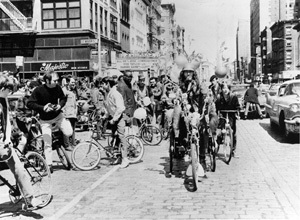 Skaggs then gathered a group of Lower East Side kids with bicycles and, along with an actress friend named Rita, who sat behind him on fake leopard skin cushions, Skaggs and his gang of bicyclers held a mock wedding parade. 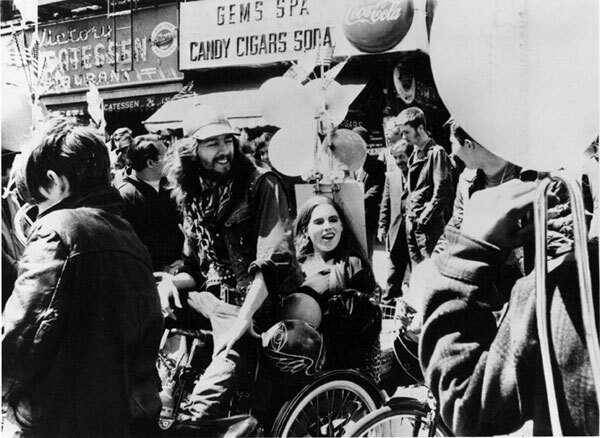 They peddled around the Lower East Side and parked on St. Marks Place and 2nd Avenue in front of Gem Spa, famous for its chocolate egg creams, where the bikers normally parked their choppers. Some of the bikers actually dug it and escorted the wedding procession as it continued peddling around town dragging pointy shoes and beer cans behind it.